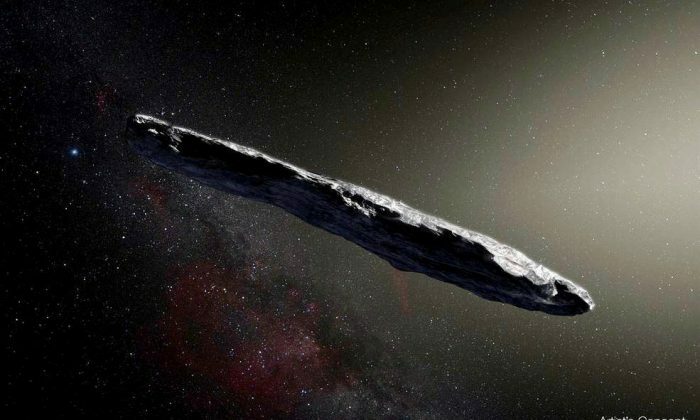 The quarter-mile long, cigar-shaped object is unlike anything astronomers have seen before, and it is believed it has been traveling across interstellar space for hundreds of millions of years. The mysterious reddish object, which is speeding through the solar system at 85,700 miles per hour, has been named Oumuamua. Its shape is puzzling to astronomers, who say it could help unlock the mysteries of how other far-flung solar systems were formed. Oumuamua was first observed by a telescope in Hawaii as it was traveling under Earth’s orbit on Oct. 19. It wasn’t behaving like most other objects in space, prompting speculation and later confirmation that it was the first object ever witnessed to come from outside the solar system. Now NASA has revealed further details about what the 400-metre-long (1,300-foot-long) asteroid looks like, including an artist’s rendering. “For decades, we’ve theorized that such interstellar objects are out there, and now—for the first time—we have direct evidence they exist,” said Thomas Zurbuchen, associate administrator for NASA’s Science Mission Directorate in Washington. Zurbuchen described the discovery as “history-making” in a statement on NASA’s website. NASA’s findings, published in the journal Nature on Nov. 20, suggest that the asteroid has been wandering through the Milky Way, unattached to any star system, for hundreds of millions of years. Combining images from different telescopes and running special filters, astronomers have been able to build up a picture of the object. It was found to vary regularly in brightness, indicating that it is an elongated object spinning end over end, according to Karen Meech of the Institute for Astronomy at the University of Hawaii. NASA believes Oumuamua is dense, comprised of rock and possibly metals, and has no water or ice. Its surface is thought to have been reddened due to the effects of irradiation from cosmic rays over the ages. Officially named Interstellar Asteroid 1I/2017 U1, its current location is approximately 124 million miles away. Oumuamua passed Mars’s orbit around Nov. 1 and will pass Jupiter’s orbit in May 2018. It will travel beyond Saturn’s orbit in January 2019. “It’s a strange visitor from a faraway star system, shaped like nothing we’ve ever seen in our own solar system neighborhood,” said Paul Chodas, manager of the Center for Near-Earth Object Studies at NASA’s Jet Propulsion Laboratory in Pasadena, California. We have a small favour to ask of you. More people are reading The Epoch Times than ever, but ad revenues are plummeting across the media. If you can, please share this article on Facebook so you can help The Epoch Times. It takes less than a minute. Thank you very much! Kids and Technology—Are They Safe to Put Together or Is Radiation Harmful to Them?